The elders which are among you I exhort, who am also an elder, and a witness of the sufferings of Christ, and also a partaker of the glory that shall be revealed: Feed the flock of God which is among you, taking the oversight thereof, not by constraint, but willingly; not for filthy lucre, but of a ready mind; Neither as being lords over God’s heritage, but being ensamples to the flock. And when the chief Shepherd shall appear, ye shall receive a crown of glory that fadeth not away. Neither as being lords over God’s heritage, but being examples to the flock. The imagery that lies back of the passage in every verse is one of a shepherd and his flock. The imagery of a shepherd was deep in the heart of Israel. Their patriarchs were shepherds: Abraham, Isaac, and Jacob tended their flocks. Moses was a shepherd. On the back side of the desert with Jethro’s flocks, Moses worked for forty years. David, the sweet singer of Israel, was a shepherd. Some of the great prophets like Amos was a shepherd. So the ideal of a shepherd was a goal toward which the heart of Israel ever reached. And that is the imagery that lies back of so many pastoral figures that are found in the Bible; and it is used by Simon Peter here. When he says to the elders, “He who is a fellow elder, feed the flock of God” [1 Peter 5:1-2], it reminds me of the passage that we read just now from the apostle Paul, speaking to the elders at Ephesus: “Take heed therefore unto yourselves, and to all the flock, over which the Holy Ghost hath made you overseers” [Acts 20:28], to feed the flock of God. The word for a shepherd is “poimēn,” the word for tending, feeding the flock is “poimainō ”; and that’s the word, “to all the flock, to feed, to shepherd, to tend, to care for the church of God, which He hath purchased with His own blood” [Acts 20:28]. This is the imagery that the Lord used in speaking to Simon Peter in the twenty-first chapter of the Gospel of John: “Simon, lovest thou Me? And he replied, Lord, Thou knowest that I love Thee. And the Lord said, Feed My sheep, tend My flock, shepherd My congregation” [John 21:15-17]. There are five crowns that are named in the New Testament. There is the martyr’s crown, mentioned in the Revelation, “Be thou faithful unto death, and ye shall receive a crown of life” [Revelation 2:10]; the martyr’s crown. There is the soulwinner’s crown: “What is our crown of rejoicing at the presence of Christ? It is even you” [1 Thessalonians 2:19]; speaking to the souls that he had won at Thessalonica. There is the soulwinner’s crown. There is the righteous crown. In the swan song, the last letter of the apostle Paul, he said, “I am now ready to be offered, and my departure is at hand. I have fought a good fight, I have finished my course, I have kept the faith; henceforth there is laid up for me a crown of righteousness, which the Lord . . . . shall give me at that day; and not to me only, but unto all them also that love His appearing” [2 Timothy 4:6-8]; the crown of the righteous. There is the victor’s crown. In the ninth chapter of the Book of Corinthians, the apostle says, “These who strive in the athletic world, they receive a corruptible crown; but we an incorruptible crown” [1 Corinthians 9:25]; the victor’s crown, the crown that shall never fade away, a forever crown. Then the last, the fifth, “And when the Chief Shepherd shall appear, ye shall receive a crown of glory that fadeth not away” [1 Peter 5:4]; the shepherd’s crown, a heavenly calling. I don’t think there is a sweeter saying by which a man ever responded to an invitation than was said by the great pastor of this church, Dr. George W. Truett, when he was invited to be president of Baylor University. Turning down the invitation and remaining pastor of this church for forty-seven years, Dr. Truett replied to the men who invited him to come, he said, “I have sought, I have prayed for and received the shepherd’s heart.” I was seated by a great layman, Dr. John L. Hill, listening to Dr. Truett preach, and he turned to me and said, “That’s the only pastor I know who cannot be persuaded to leave his pulpit.” The shepherd’s heart, the heavenly calling; “And when the Great Shepherd shall appear, ye shall receive a crown of glory that fadeth not away” [1 Peter 5:4]. 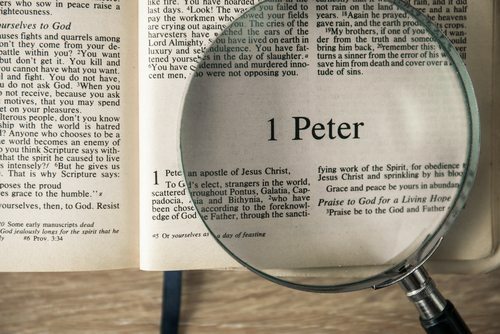 And lest we think, lest we should be persuaded, that this applies only to the pastor, in the third verse of this passage, the apostle Peter uses one of the most unusual words to describe you that you could find in the revelation of God. He calls all of us “clergy” [1 Peter 5:3]; all of us. We’re so accustomed to thinking of the clergy as being the pastor and the fellow ministers who work with him, and all the other of the congregation are people who belong to the laity. That’s something that we have done; but it is not in the Scriptures. For in the third verse Peter says all of us belong to the clergy, we all are called into that heavenly work of our Lord [1 Peter 5:3]. Remember, Stephen was a deacon [Acts 6:1-5], Philip was a deacon [Acts 6:1-5], Aquilla was a tentmaker; these tremendous—and I cannot escape the use of the language known to us, though it’s not in the Bible—these laymen, these lay people, they are the ones who with the apostles, and the prophets, and the pastors, and the evangelists built up the household of faith. It is the calling of all of us: the love for the lost, the shepherding of the flock. I speak now of the seeking heart of the shepherd. And I do so because of the beautiful parable of our Lord of the lost sheep [Luke 15:3-7]. “What man of you, having an hundred sheep, if he lose one of them, doth not leave the ninety and nine, and go out in the wilderness to seek that which is lost, until he find it?” [Luke 15:4]. The shepherd heart is a seeking heart, always that. In the fourth chapter of that second letter to Timothy, the apostle Paul writes to the young pastor of the church, “Do the work of an evangelist” [2 Timothy 4:5]. Now Paul is referring to the gifts of the Holy Spirit to the church, and he mentions them in Ephesians, “For God, when He ascended up on high . . . gave gifts unto men” [Ephesians 4:8], then he names them, “apostles, prophets, evangelists, pastors and teachers” [Ephesians 4:11]. And when Paul uses that word, “Do the work of an evangelist” [2 Timothy 4:5], he is referring to the work of one of those charismatic gifts from heaven. However our assignment may be, we are to do the work of an evangelist; the seeking spirit, the seeking heart, the caring and the praying and the inviting by which we introduce people to Jesus. And that note ought always to be in everything that we do: a seeking, a searching, an inviting, a wooing, a winning. In these days past, I was invited to speak to a convocation of interdenominational leaders and people in the East. It was a tremendously important meeting, lasting a week. And I was to preach each night for a week. It was attended by all kinds of ministers, among many others there, including our liturgical ministers, who dress in clerical garments. As a few days passed, there was a man, sixty-seven years old, whose wife wrote me a letter saying he would be there, and that she was praying for him that he might be saved. After a service one night, that man gave his heart to Christ. And there was another young man, waiting for me at a late hour, who on his knees with many tears gave his heart to Christ. And when Sunday night came in that series of conferences and services, I gave an invitation. It was blessed of the Lord. There were those who came forward, including those two, accepting Christ as Savior. And there were many others who responded. There was a great group of that congregation who had never seen an invitation, had never looked upon it, had never shared it; it was a new experience to them. To us, that is almost unthinkable that there should be religious people, Christian people, who had never seen an invitation, and had never been in an service of invitation. The reaction among some of the liturgical ministers who were there was very sharp and very critical. One of the programs during the day was a panel of ministers, and in that panel they called upon me to defend what I had done. And their words were many times caustic as they talked to me. They said it was a cheap, emotional, melodramatic scene and service. Needless to say, it plunged me into heavy discouragement. And that afternoon I was as heavy in heart as I’ve ever been in my life. Is not that the great chief moving reason back of all that we do in the house of God and in the church of the Lord? There ought to be in it a seeking note. “What man of you, having an hundred sheep, if he lose one of them, doth not leave the ninety and nine, and out in the wilderness search for the lost, until he find it?” [Luke 15:4]. Just for us to meet in all of these multi-faceted activities of the church, and we plan, and we gather, and we have oh so many, many things, just to do them for their own sakes, just like a squirrel in a cage, over and over and over again, just to do it, it’s a mechanical thing, it’s a routine into which we’ve fallen, and our energies are poured into just keeping it turning, keeping it going. Sometimes we use the word, the expression, “just oiling the machinery,” just keeping the wheels moving; oh, of all things I could not suggest a greater waste or a greater sadness than for us to give ourselves just to that. We just keeping the thing going, keeping the organization alive, keeping the wheels and the machinery moving. Oh no! Dear God, no! But the great purpose of it is that seeking ministry, that invitation. I was pleased, I was delighted last Friday night, here in Coleman Hall, the Primary divisional leadership had their convocation and their meeting and their supper. But what they had done was, they had invited many who were lost and unchurched at that leadership meeting. And when the program was over – which was a delightful program, and interesting, and alive – when it was over, then I was asked as the pastor to invite these who were lost and unchurched to come to the Lord and to us, and we had a gift for each one of them, and placed it in their hands. That’s it. That’s it. The seeking note, the searching heart, the caring spirit, the hand of outreach and invitation. I have one other thing in the Bible regarding the shepherd’s heart. A heavenly calling, “When the Chief Shepherd shall appear, He will give you a crown of rejoicing, a crown of reward” [1 Peter 5:4]; second, the seeking heart, “out until he found the sheep that was lost” [Luke 15:4]; last, the sacrificial life. The tenth chapter of John, “I am the good shepherd,” says our Lord, “I am the good shepherd: and the good shepherd giveth His life for the sheep” [John 10:11], lays down His life for the flock. When we look at that and think of that and remember that the Bible applies it to us, there is a humbling in it; it brings you to your knees. We who care for the church, who shepherd the flock—and Peter says, “And that is all of us, under our presbuteros,” all of us loving and tending and seeking and caring [1 Peter 5:3]. The good shepherd giveth his life for the sheep [John 10:11]; it is a sacrificial life. It’s not an inadvertence, it’s not adventitiously done, it’s not just a side issue with us; but it’s central, it’s at the heart of our life and living, this church of God, this flock of the Lord. After all, there has never been anything built of worth, of blessing, that has not been paid for in human life. I think of our nation. We so many times are oblivious to the price that is paid for our freedoms and our liberties. Why, in these last few years there have been more than forty thousand American boys who have died in Korea. In these last few years there have been more than forty-five thousand American boys who have laid down their lives in Vietnam. These men have poured out their blood for us. How an American could look with disparagement and disrespect upon our country I cannot think, I cannot imagine. It was bought. Our liberties that we enjoy, our blessings that we share, they have been won for us with human blood. Our state is like that, Texas. I read a book, and in it is a sentence that stayed in my mind: the man said, “I believe that Texas is built upon the shoulders of Rangers who have laid down their lives for the state.” Little mounds of earth all over the land, washed by the rain, cried over by the wind, looked down upon by the stars, and mostly forgot. You hardly think of that when you think of Texas, built on the shoulders of men who laid down their lives for the state. The Christian faith is like that: it is the sacrifice of life that has propagated it. Standing in Ogbomosho, in West Africa, I looked at our great hospital; what a blessed ministry! I looked at our seminary; what a marvelous instrument for teaching and training! I looked at our churches, some of them large in that city. And then I stood at the graves of some of our missionaries, who lie in the dust of the earth, cut down at the very prime of life by dreaded fevers. The building of the Christian institution and the Christian faith lies in the sacrifice of life. And I think of the church, the flock of God, this one. Once in a while, when I walk down that street there, San Jacinto, there’ll be a glint of light, a reflection of the sun from the stained-glass windows that are in that building; just a glint at a certain angle of the sunlight beating against the window. And when I see that, I think of those days when I was struggling, seeking to build that building. And there was a girl, a woman in this church, who worked downtown. And listening to the appeal for that building, she brought to me her diamond ring; it was a beautiful, large stone, and said, “I give this to you to help build that building.” The only thing of value that she had, that ring; with reluctance I took it. In days that passed, one of her friends said, “You know, I wondered what had become of that ring; I had never seen her that she didn’t have it on her finger.” We sold it and put the money in that building. And when I see that glint of light that sometimes is reflected by one of those stained-glass windows, I think I am seeing the flash of that ring, given by the humble, God blessed, working girl downtown. The church is built in the sacrifice of its people. And this is the pouring out of life that makes possible the rearing of our children in the faith of the Lord. A few days ago, I happened to stumble into the associate pastor of a great church on the other side of the Mississippi River, and began talking to him. And it brought back to mind, in our conversation, something that I spoke of a long time ago. I held a meeting in that man’s church, one of the most strategic in the Southern Baptist Convention, and in the cities of America. The occasion was, I was returning to Dallas from the Southern Baptist Convention that met in an eastern city, and I had just listened to that man preach the convention sermon. He did it magnificently, he glorified the Lord; and the Spirit of God was in him. As I sat on the plane, coming back to Dallas, there was a businessman seated by my side, who had been reared in a little town in Tennessee. As we talked together, he learned that I was a Baptist minister; and then he said, “So you’re a Baptist preacher.” He said, “I belong to the Methodist church.” He said, “You know, in the little town in which I grew up in Tennessee, there was a girl who gave birth to an illegitimate child, a little boy. And being reared in a small town, I knew the shame and the disgrace that would come upon a girl who was the mother of an illegitimate child.” He said, “This girl gave birth to an unnamed child, a little boy. And she went to the edge of the town, and there in a little cheap cottage, she took in washing, and reared that little boy.” He said, “The little fellow grew up, we called him Little Willie. He grew up, and the mother slaved for the boy, and worked for the lad. And not only through school and the town, but she worked and slaved and sent him through college.” And he said to me, “You know, I have been told that he has become a great preacher.” And he said, “Isn’t that a marvelous thing that that boy should be a great preacher?” He said, “He’s a Baptist preacher. I just wonder if you knew him.” I said, “What is his name?” And he called the name of that marvelous preacher I had just heard delivering the sermon at the Southern Baptist Convention. “And when the Chief Shepherd shall appear, you shall receive a crown of glory” [1 Peter 5:4]. Does that mean we’re going to receive the commendation and the blessing of God for all of these things that we give our lives to that consume us day after day? I doubt it. Whether we’re rich or poor, whether we live in a big house or a little house, whether we were famous or unknown, whether they say we succeeded or failed, I think those things at that great final day will be absolutely immaterial. But this shall stand up great in the sight of God when the Great Shepherd shall appear [1 Peter 5:4]: that we poured our lives, in the name of the blessed Jesus, into these little ones growing up, into the souls and lives of these who needed to be saved, in tending and shepherding and caring for the flock of God [1 Peter 5:2]. Pastor, what is the purpose of such a message as this? Well, maybe preaching to myself, but maybe also to encourage us to give our lives to great first things. What shall be chiefest and primary and first in my life? It shall be this: I shall give my life to the ministry of the caring for and the loving and the praying for God’s lost sheep, and God’s precious flock, the building up of the household of faith. This shall I do, and then my other work will be to pay the expenses while I give my life to the service of Christ. Our time is spent. And in the spirit of the appeal that our apostle Simon has made, to give your heart to Christ, to come into the fellowship of His church, to answer the Holy Spirit’s appeal in your soul, as God shall say the word, lead the way, open the door, down a stairway, come; down one of these aisles, “Here I am, pastor, I give my heart to Jesus,” or “putting my life in the fellowship of the church. My whole family, we’re all coming today.” Or just two of you, or just you, on the first note of the first stanza, while we sing this song, make it now, do it now, come now, while we stand and while we sing.